One of the most important aspects of the Occult is that of The Tetragrammaton. 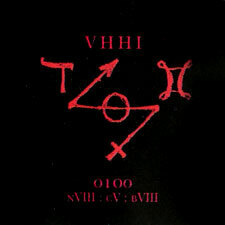 The Tetragrammaton is a Greek word meaning 'the four lettered name' and represents the four lettered name of god; the four Hebrew letters Yod, Heh, Vav, Heh, which transliterates into YHVH, or IHVH in Latin. Mispronunciations of The Tetragrammaton is where the name Jehovah, YahWeh, and YahVeh derive from. As all four letters are consonants, the true name of god is unpronounceable. Because the name is unpronounceable, inherently many derivations of a pronunciation exist which the magician/Kabbalist can invoke in the work he performs. The quote of "Man Made In The Image Of God" also pertains to The Tetragrammaton as when all 4 Hebrew letters are written in an up-and-down orientation the word itself creates the form of a human being. The illustration above within Holy Wood is drawn by the Nineteenth century magician Eliphas Levi, who is most famous for his book Transcendental Magic and his depiction of the Baphomet, Sabbatic Goat or Goat Of Mendes, more on the subject of which can be read below. The Tetragrammaton in this representation is drawn as a Pentagram, which is one of the most important and misunderstand elements in the Occult. The Pentagram has 5 points, each of these points represents one of the 5 elements in nature: Earth, Air, Fire, Water and the topmost center point represents Ether, or Spirit; all 5 elements of god and nature. Within the Pentagram itself contains the graphical representations of all 7 "planets" and Alchemical elements: The Moon (Silver), The Sun (Gold), Jupiter (Tin), Saturn (Lead), Mars (Iron), Venus (Copper) and Mercury (Mercury or Quicksilver, the most sublime of all elements). With the 'eyes of god' in the center, thus this graphical representation of the The Tetragrammaton is an all encompassing depiction of god, nature and the Occult. Different permutations of the Name also exist with each permutation invoking different magickal elements. 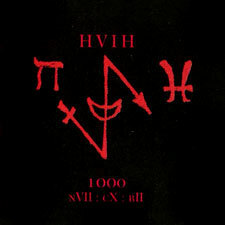 These permutations are what the esoteric symbols within Antichrist Svperstar represent, which are the permutations of IHVH into : HIHV, HVIH and VHHI. The graphical depictions of which are relatively new within the occult and are outline in Donald Tyson's book The Tetragrammaton, which Manson himself referenced as an influence in his autobiography. 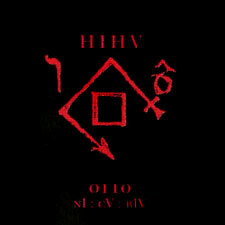 The 3 symbols in Antichrist Svperstar are derived from the use of a key known as The Tetragram, a diamond or two dimensional representation of a tetrahedron, with one of the four letters of the name IVHV at each corner. 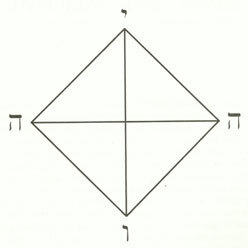 By drawing a line by tracing the edges and lines of the Tetragram to form a graphical permutation of The Tetragrammaton a Sigil, or a graphical line representation of a name, is made. Any name or word can be made into a Sigil in the occult and for each name or word a different diagram is used to create it. Creating a Sigil of 'Manson' or 'Lustmorder' for example, a base diagram containing and representation of those names must be used. This is also often done using what are known as Magic Squares, which are squares made up of square segments, each containing a number and the sum of the numbers in each line is equal to the sum of every other line within the square. APPEARANCE: Angular body of average height, thin but muscular. Very narrow hips and small breasts. A large head that tapers to a narrow chin. Dark-brown eyes; dark skin; short, coarse, straight brown hair; thin, colorless lips, small teeth of poor quality. She tends to glower and frown. NATURE: Repressed, narrow-minded, exacting, unforgiving of faults in herself and others, severe in judgment, hidebound, punctilious, selfish, pessimistic, worrying, analytical, critical, unsympathetic. She tends to scold others for their faults. FUNCTION: Finds faults or leaks in systems. Reveals mistakes or shortcomings in personality, particularly where these affect professional status. Makes known the weaknesses of competitors or rivals. Warns of business failure or stock collapse. Turns the weaknesses of others against them. Punishes disloyalty or betrayal. APPEARANCE: Thin limbs; a long, thin neck; small head with short, straight hair, very glossy and of a dark-brown color. Small nose and ears; dark blue eyes surrounded by blue shadows under the skin; poor posture; very thin hands held limp at the wrists; a small, pale mouth and weak chin. Small breasts, narrow hips. NATURE: Unsure and vacillating, hesitant, touchy about criticism, confused, extravagant, emotional. Tends to be secretive and likes to place burdens upon others shoulders. Outwardly submissive but inwardly resentful. She cares jealously for those she loves and tends to smother them with attention. FUNCTION: Protecting a loved one, particularly from self-destructive behavior. Watching over animals. Creating works of art of a fantastic or dreamlike type. She aids in the expression of psychic communications such as automatic writing. Enforces service and self-sacrifice upon those who would flee from their responsibilities. APPEARANCE: Slight slender, but active, with short, curling brown hair on a small skull; prominent pink ears; alert and intelligent golden eyes under arched brows; a long, upturned nose set in a triangular face with a tapered chin; a wide, smiling mouth. Her face is constantly in motion, expressing her feelings, and her hands dance about when she speaks. NATURE:Full of nervous energy, changes opinions abruptly, clever in a cunning was observant and perceptive about the thoughts and feelings of others, superficial, lazy, flirtatious and fickle in her affections, emotionally detached, lies easily - not out of malice, but to avoid trouble. FUNCTION: Exposes betrayal of trust, false relationships, adulteries, deceit, intrigue in the work place, scandals, gossip, slanders, libels. Testing friendships and love relationships. She is the angel of lies. APPEARANCE: Body frame of average height; knotted muscles, angular, large head; prominent ears; large forehead over small, dark-brown eyes; crooked nose; small mouth; bad teeth; weak, bearded chin; sallow complexion with moles or pockmarks. An intense but evasive glance. NATURE: Serious, determined, enduring, calculating, emotions held under tight control, rational, exacting, very ambitious, highly disciplined, responsible. His serious and rational approach to things makes him seem dull and pedantic. A subdued voice, harsh when raised in anger. FUNCTION: Matters of personal ambition regarding business or professional career, governmental job, rank, professional standing or awards, credentials, degrees, titles. Climbing the corporate ladder, overcoming obstacles to ambitions, gaining responsibility and trust of superiors. APPEARANCE: Soft, overweight figure of below average height; wavy, dark-brown hair on a round skull; pale complexion with a tendency to perspire; small nose and small ears that lie flat; very dark blue eyes; heavy eyelids and dark, arched eyebrows; a sensual mouth with a full bottom lip and a weak chin. NATURE: Intuitive and aware of subtle emotional currents, psychic, creative in the lyrical arts such as poetry and music, highly impressionable, easily expresses feelings, very sympathetic to others. This angel is the happiest near the seashore. Smiles but rarely laughs. FUNCTION: Songwriting, music, the dramatic arts, matters of faith or belief. Achieving empathy with others. Protection of seamen or those who travel by sea. Attaining purity. Caring for the sick. Protecting and caring for animals. Encouraging pleasant dreams. APPEARANCE: Thin frame with large chest; very mobile hands with long fingers; a flexible face; wide mouth capable of many expressions; large nose; large, prominent ears; high cheekbones; golden eyes; long chin; tanned complexion; light brown, curling hair. NATURE: Animated, expressive, restless, talkative, always seeking something to do or somewhere to go, witty with a good sense of humor, always seeing the lighter side in every situation, clever with his hands, adaptable, versatile. Detests hard work. Bright, cheerful laughter. His voice is agreeable, but he tends to chatter about nothing. FUNCTION: Diplomacy, arbitration, brokering deals, managing artistic talent or property, arranging travel, teaching, publishing, legal arguments, creative writing, news reporting, publicity, media events.